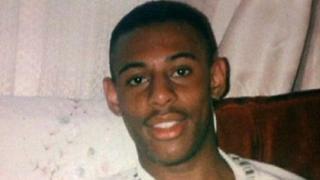 A police officer under investigation over claims of "discreditable conduct" after the murder of Stephen Lawrence is to return to his job. Cdr Richard Walton, who was removed from operational duties, will resume his role on 1 December. Mr Walton is facing an inquiry by the police watchdog over claims he met an undercover officer who had information about the Lawrence family. Doreen Lawrence's lawyer said she was "appalled" by the decision. The Independent Police Complaints Commission investigation into Mr Walton is ongoing. Lawyer Imran Khan, who represents Stephen's mother Doreen, said: "She is appalled by the decision to put him back on operational duties even before the investigation is complete." Mr Walton was temporarily removed from his job as head of the counter-terrorism command SO15 on 7 March following the publication of Mark Ellison QC's report. The report revealed an undercover officer held a meeting in 1998 with Mr Walton, who was then an acting detective inspector working on Scotland Yard's Lawrence review team and was responsible for making submissions to the Macpherson Inquiry, which looked into failures in the investigation into the 18-year-old's murder. Mr Walton is alleged to have "obtained information pertaining to the Lawrence family and their supporters, potentially undermining the (Macpherson) inquiry and public confidence", the report said. It is also claimed Mr Walton gave inconsistent accounts to Mr Ellison's review team. In a statement, the Met Police said: "As would always be the case the decision has been kept under review. "In June it was decided that Commander Walton will return to his post, SO15, in the absence of any new information being received from the IPCC. "As no information has so far been received that remains the current plan, and he will move on Monday, 1 December. The IPCC have been made aware of our intention." The IPCC is also investigating the actions of former officer Det Insp Robert Lambert and Cdr Colin Black, who were both identified in the review as having played a part in setting up the meeting with the undercover officer. Stephen was 18 when he was stabbed to death in an unprovoked attack by a gang of white youths in Eltham, south-east London, in April 1993. In 2012 Gary Dobson and David Norris were found guilty of murdering him and sentenced to minimum terms of 15 years and two months and 14 years and three months respectively.